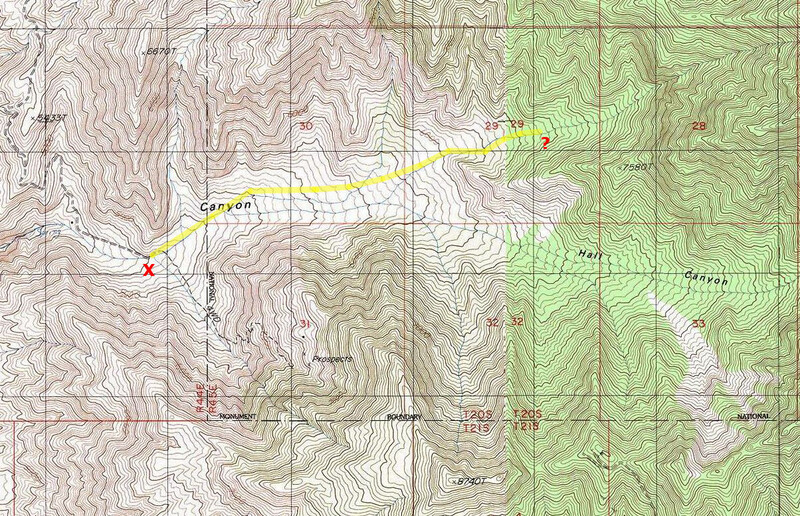 Anyone ever followed Digonnet's route up to Telescope from Hall Canyon, via its north fork, and up to the Jail/Hall divide around 8200 ft, and on up that ridge to the top? Even above Rowland's Canyon? Satellite shows an old road going up to about 7800 ft up the North Fork, and eventually up the ridge to the Hall/Jail divide at 8200 ft. I know Steve Hall has hiked from Rowland's cabin into the South Fork and up to the Hall/Surprise ridge. Yeah, I think the dense vegetation is only in Hall Canyon below Rowland cabin. I day-hiked the cut-over trail (old road) from Jail Canyon over to Hall Canyon, poked around a little, then hiked back. That's my only experience around there. On that hike I was able drive to the Rowland Cabin and hike up the old road that goes straight up the main canyon a few miles to a mine that was at the end of the road. Not sure of the exact elevation, but it was well into the pinyons. I also drove up to the cabin a few times before 2006. There was also a road that went up to the ridge a half mile or so above the cabin. I didn't go to the top of that one. As noted in the last post, the only thick vegetation I encountered was at and below the cabin, which you wouldn't need to hike through if you hike in from Jail over the old cutoff. That's pretty much all I did, except I started in the afternoon and camped along the way....I would have stayed longer if I had found water easily, but I was low and decided it best to head back. How did it look from there as far as getting up to the Jail/Hall divide? Digonnet's route follows that to the crest. Here's a topo map which approximates the route as I recall it. The X is the furthest point I ever drove up the canyon. The ? is the approximate location of the mine that I reached. BTW, I added three additional pics. I was disappointed that I didn't have lots more pics from that hike. Nowadays I'm crazy with the camera. Back then I was still thinking about disk space! I'm crazy with the camera too The shot up to Telescope makes the area look a little less intimidating...thanks!